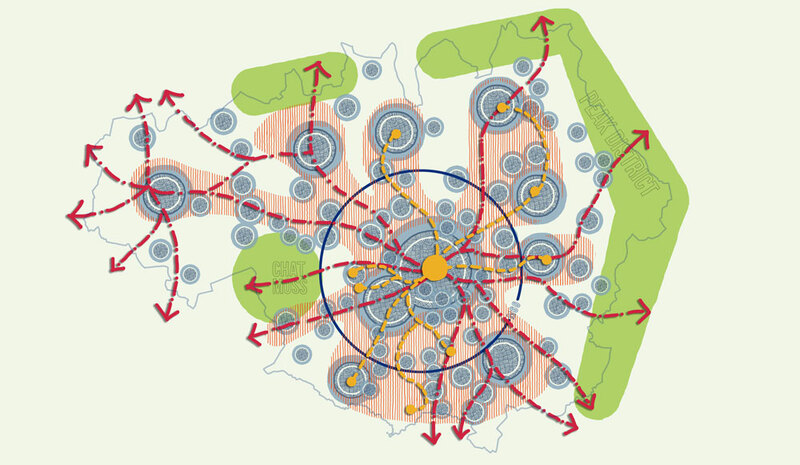 URBED were appointed by the Greater Manchester Combined Authority to support the production of the second draft of the Greater Manchester Spatial Framework. The framework is a joint plan for Greater Manchester that will set out the future strategy for housing, jobs and infrastructure across the city region. It is being produced by all 10 Councils within Greater Manchester, who are working in partnership to plan strategically for the future. The first draft of the Greater Manchester Spatial Framework was consulted on from October 2016 to January of 2017 and the 25,000 responses received are helping to shape the next draft of the document. URBED have been brought on board to produce visual material to illustrate the narrative of the second draft of the document, creating a graphically driven summary of the strategy behind the plan. We are producing a spatial portrait of Greater Manchester, creating concept strategic masterplans and developing visual material to help explain the policy document to the public.